Alviano is a middle age village sourrounded by green hills and dipped in a surrealistic but rocky atmosphere at the same time. Its history starts with feudalism. Alviano was named Feud in 933 under the latin name of Albianum, by the count Offredo, belonging to the family of emperor Ottone III. His dynasty dominated untill the time of the crusades, in which also Bartolomeo from Alviano partecipated. 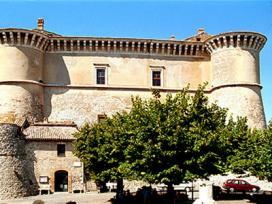 The castle, which belonged to the Alviano family before and to the Doria Pamphili family after still dominates the village and can be visited. Dating to the same time, the parish church is the most beautiful example of religious archiecture in the village. However, what really makes unique Alviano is its naturalistic oasis. The latter was created on 1990 due to a barrer on river Tevere done by Enel (fomer national industry of electricity production), and today it is more than 9 square Km wide, under the protection of WWF Italy. The museum of peasant life is also worth visiting.